Jewelry box personalized engraving services. 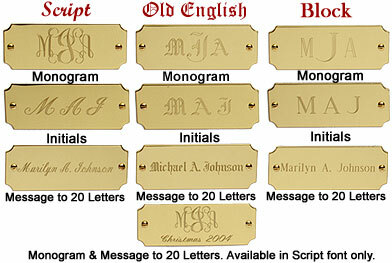 Monograms are engraved first name initial to the (left), last name initial (centered and larger), middle name initial to the (right). The last name initial is engraved taller and centered is to accentuate the last name. Initials are engraved with first name initial to the( left), middle name in (center) last name initial to (right). This style is engraved all same size of font. This is engraved with two lines. The top of the plate is engraved with a monogram with the first name initial to the (left), last name initial (centered and larger), middle name initial to the (right). The second line is engraved with up to 20 letters of your choice. A memorable touch for any occasion. At this time this selection is only being offered in script.